She considers herself the assistant to the building, helping organize employee parties, handling the mail, maintenance issues, and so much more. Even the dreaded malfunctioning printer is no match for her. 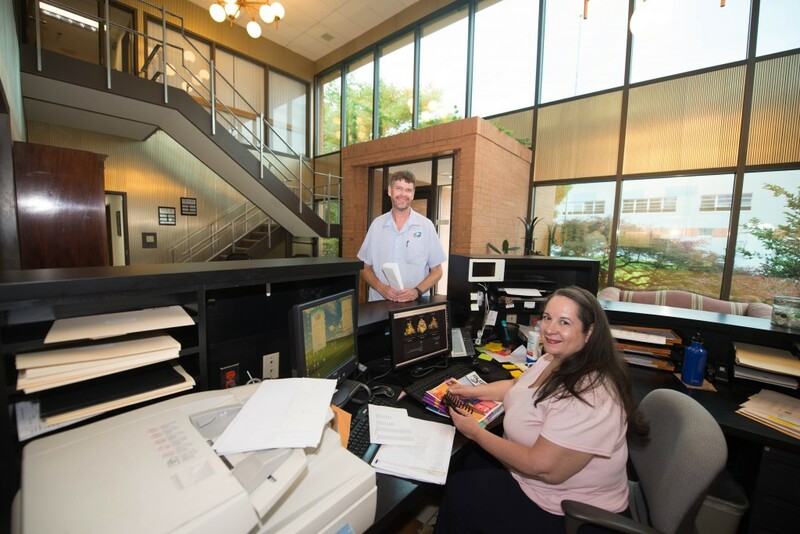 Sharon is friendly to all, greeting employees, asking about their day, and organizing both birthday and sympathy cards, both farewells and milestones. “I just try to help out when I can, and make sure people have their supplies, or whatever they need,” she says. Having had the privilege to visit 22 countries, and having spent a few years in Ethiopia growing up, Sharon says she’s thankful for being in the social position she’s in, and that’s led her to several current volunteer roles in the local community. She’s a volunteer leader with Hands On, a division of United Way; she knits and crochets for a program called Knit and Give, which donates cold weather clothing items to charity organizations; and she also spends Saturdays at Ten Thousand Villages, a local fair-trade store. Artisans from places such as Thailand, Vietnam, Cameroon, Africa and India are paid a living wage for their goods, empowering families and aiming to eliminate slavery and human trafficking. The unique handmade goods or food items are then sold in the United States and elsewhere. When the opportunity arose to volunteer dealing with fair-trade art from Africa, Sharon said it was a great fit, since she still has numerous African items in her home. From the letter carrier, Peter, to delivery people to interviewees, Sharon greets them all. She has advice for those seeking new jobs – you’d better look sharp. Walking into the building on a rainy Monday morning, or leaving for a sunny three-day weekend, Sharon’s positivity radiates out like a sunbeam as she wishes you well.